In the Chartons-Bacalan quarter on the banks of the Garonne River, the Residhome Bordeaux aparthotel offers ready-to-live-in apartments and a wide range of customized services and amenities. The residential hotel is located to the north of Bordeaux's historic center, right on the riverfront. You will appreciate the vibrancy of the neighborhood, famed for its typical old-world architecture, bric-a-brac shops, as well as the Place de Chartrons and its abundance of lively restaurants. You can easily explore the Cité du Vin wine museum, just 500 meters away. Bordeaux, a UNESCO world heritage site, offers a wide range of cultural venues, historical monuments, and typical neighborhoods to explore during your stay. The tram is right next to the residence, and will take you straight the city center, the famous Place de la Bourse, the Grand Théâtre, as well as the Rue Sainte-Catherine. As Bordeaux is the ultimate wine destination, the residence is also an ideal base from which to explore Bordeaux's wine routes. 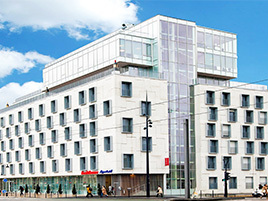 Open 24 hours a day, Residhome Bordeaux Bacalan offers 97 fully-equipped apartments, ranging from studios to one-bedroom units. Each apartment has a living room, a fully-equipped kitchen (microwave, refrigerator, glass-ceramic cooktop), a bathroom, an office area, and a flat-screen television.